A true player's shoe designed to perform, in all weather conditions and on all types of terrain. 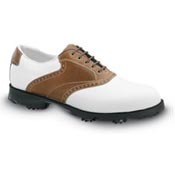 Dexter's Players Series is built for golfers looking for waterproof walking comfort and lateral stability during the swing. Our innovative tri-density CR3 outsole delivers lightweight cushioning, superior flexibility and torsional stability, while the Fast Twist™ Reactive 2 dynamic grip technology system guarantees great traction. This classic white and bomber brown saddle features waterproof full grain leathers and soft padded linings that enhance your comfort and provide a secure fit.